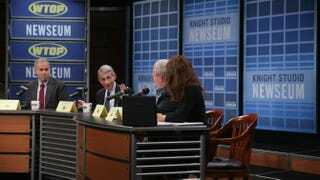 Anthony Fauci (second from left), director of the National Institute of Allergy and Infectious Diseases, speaks as (from left to right) Jesse Goodman of the Georgetown University Medical Center and WTOP news anchors Bruce Alan and Debra Feinstein listen during a town hall meeting on Ebola Oct. 20, 2014, at the Newseum in Washington, D.C.
"Officials at the University of South Florida St. Petersburg uninvited 14 journalists from African countries to visit for three weeks on Oct. 31 for the annual Edward R. Murrow Visiting Journalists program. The program is organized by the US Department of State for foreign journalists to discuss their experiences and share stories about reporting in their countries.," Jack Pickell and Chelsea Rice wrote for Boston.com Monday in an ongoing summary of Ebola developments. "University of South Florida St. Petersburg's Department of Journalism and Media studies was one of seven journalism schools hosting 100 of the rising top journalists from around the world. Only the African journalists' trips were canceled. In addition, "The University of Georgia cancelled the Oct. 23 guest lecture of an award-winning Liberian journalist after concerns were raised that it could expose students and the campus community to the Ebola virus," Brad Schrade reported Sunday for the Atlanta Journal-Constitution. "Wade C.L. Williams was set to deliver the McGill lecture to talk about her experiences covering the Ebola crisis. An editor for Front Page Africa, a news website and newspaper in Monrovia, Liberia, she works in one of the hardest hit West African countries with close to 2500 deaths reported this year from the virus. "On Oct. 13, the university touted her upcoming visit, co-sponsored by the journalism school, on its website. But just days later, in the face of concerns from parents and the public, UGA announced her trip would be postponed and the McGill lecture would be delivered by Washington Post reporter Todd Frankel. Frankel covered the Ebola crisis earlier this year. . . ."
Meanwhile, the Daily Orange, student newspaper at Syracuse University, wrote Monday that the majority of its editorial board "disagrees with S.I. Newhouse School of Public Communications’ decision to disinvite a Pulitzer Prize winning photographer from its 2014 Fall Workshop. The school gave in to the hysteria surrounding Ebola and disinviting the photographer reflects poorly on Newhouse. . . ."
The photographer, Michel du Cille of the Washington Post, meanwhile, dominated the front page of the Post Style section Monday with an essay and photos from his two-week assignment in Liberia, headlined "The humanity in my lens" in the print edition. "In one of the most emotional encounters I faced in Liberia, I photographed a family that accompanied a sick woman who seemed near death as they sought treatment," du Cille wrote. "She was bleeding from the mouth and her breathing was shallow; she was not ambulatory. As the husband, a sister, a brother and a friend descended from the van, each wore large plastic bags around their hands, feet and bodies, trying to protect themselves from infection with makeshift coverings. They knew it was the only way to get their very ill relative to the Doctors Without Borders Ebola treatment unit. Waiting outside the gates was a given, but to the anxious family, I am sure one hour seemed far too long as the patient worsened. "At one point, I approached the woman's sister, who had secluded herself against a wall away from the others and her sister fading away in the van. Standing at a safe distance, I asked her how long her sibling had been sick; she said about a week. She asked me questions that I could not completely understand and could not answer. As we tried to converse, neither fully understanding the other's dialect, our eyes did the talking. To me, her eyes said, 'This is the end.' I looked at her and said, 'You know she is very, very sick.' She said, 'Yes, I know.' As I tried to continue our fruitless conversation, my voice broke and suddenly tears came involuntarily. By then, more patients arrived by ambulance and I resumed taking photographs. "It is profoundly difficult not to be a feeling human being while covering the Ebola crisis. . . ."
Du Cille and other Washington Post journalists who covered Ebola in West Africa were to meet with other reporters Monday to discuss their experiences covering the outbreak, Mark Berman wrote Sunday for the Post. "The quarantine against possible Ebola exposure ends this week for Dr. Nancy Snyderman, but the troubles clearly aren't over for NBC News' chief medical editor," David Bauder wrote Monday for the Associated Press. "An admitted lapse in the quarantine, combined with a curiously imprecise explanation, unleashed a furious response. NBC must now decide whether Snyderman's credibility is too damaged for her to continue reporting on Ebola or other medical issues and, if so, for how long. The network would not comment. "Snyderman, a surgeon who spent 17 years as a medical correspondent for ABC News and has been at NBC since 2006, covered the Ebola outbreak in West Africa and worked briefly with Ashoka Mukpo, the cameraman who caught the virus and is now being treated in Nebraska. Upon returning to the United States, Snyderman and her crew voluntarily agreed to quarantine themselves for 21 days, the longest known incubation period for the disease. They have shown no symptoms. "Yet New Jersey health officials ruled that her quarantine should be mandatory after Snyderman and her crew were spotted getting takeout food from a New Jersey restaurant. . . ."
Caucus Chair: Sharp Cuts of CNN Blacks Would Be "Affront"
Rep. Marcia L. Fudge, D-Ohio, chairwoman of the Congressional Black Caucus, Saturday called "particularly concerning" reports that layoffs at Time Warner "have significantly reduced the number of African Americans in senior and executive roles in the company's flagship news organization, CNN." Fudge said, "In a nation growing increasingly more diverse, it is imperative that the organizations tasked with keeping us informed reflect the same diversity. Ethnic sensitivity both on-camera and behind it demonstrates a corporate understanding of the benefits of diversity, and a genuine respect for the audiences' needs. "Any staffing changes that disproportionately cut the number of African Americans at CNN — intentionally or otherwise — are an affront to the African American journalism community and to the African American community as a whole. It is my sincere hope that these reports are not true, and that Time Warner works to ensure that the diversity of its viewers across the country, and the world, is reflected and protected in all areas of its organization." Safiya Jafari Simmons, spokeswoman for Fudge, was unable to say Monday what prompted Fudge's statement, which the National Association of Black Journalists posted on its website. NABJ announced Friday that a CNN representative of the network told NABJ President Bob Butler that the network was withdrawing its support of the association's 2015 convention. CNN replied in its own statement, "Following NABJ's recent comments about CNN, we informed them we were reconsidering our relationship, but we were clear that we had not made a final decision. It's surprising to us that they would choose to make such a statement." " 'They're basically calling me a liar,' said Butler in a chat with the Erik Wemple Blog," Wemple wrote Monday for the Washington Post. " 'That's very disturbing.' "
In another development, CNN Politics, formerly the workplace of black journalists Bryan Monroe and Halimah Abdullah, has hired Chris Moody, formerly the political reporter for Yahoo! News, as a senior digital correspondent, and Alexandra Jaffe, formerly of The Hill, as part of its breaking news team, according to cnncommentary.com. Ed O'Keefe, recently named vice president of CNNMoney and Politics, has said he would double the size of the politics staff as he revamped its operations. "'Today' show third hour co-anchor Tamron Hall took one for the team this weekend," Brian Flood reported Monday for TVNewser. "Doctors diagnosed Hall with a deep muscle tear developed from screaming too much during a weekend trip to a haunted house. Al Roker, Natalie Morales and Willie Geist joined Hall for a taping at the Brighton Asylum haunted house in Passaic, New Jersey Friday night. On the way home Hall complained of stomach pain, which got worse into Saturday morning. . . ."
Flood also wrote, "The house takes an estimated 20 minutes to complete and Hall was apparently screaming the entire time. The segment will air later this week." "The NFL's handling of the Ray Rice domestic violence controversy has become a cautionary tale for fellow professional sports leagues. The NHL's suspension of Slava Voynov on Monday morning is the latest example that pro sports outfits are taking domestic violence seriously," Tim Baysinger reported for Broadcasting & Cable. "Voynov, a defenseman for the defending champion Los Angeles Kings, was suspended indefinitely by commissioner Gary Bettman, following his arrest on charges of domestic violence Monday morning. "Unlike the NFL, which at times appeared flatfooted and reactionary, the NHL was able to get their announcement of Voynov's suspension out ahead of any media reports. With the NHL a distant fourth among the professional sports leagues in terms of popularity and media coverage, it was much easier for Bettman and his executives to get ahead of the story. . . ."
"The worst fate of all may be to make a terrible mistake and then learn the wrong lessons from the experience," Eric Deggans wrote Sunday for the NPR "Code Switch" blog. "That's the thought I had reading a heartfelt column about the Boston Herald's unfortunate decision to publish a cartoon featuring a White House gate-crasher asking the nation's first black president if he had 'tried the new watermelon flavored toothpaste.' "
"Lesson #1: Staff Diversity Brings Better Journalism . . .
"Lesson #2: In Race and Media, History Matters . . .
"Lesson #3: Racial Miscues Are Big News . . . "
"A New York Times story about a group of men with intellectual disabilities who worked in servitude for decades has won top honors in the 2014 Katherine Schneider Journalism Award for Excellence in Reporting on Disability," Arizona State University announced last week. The Oct. 13 release also said, "First place went to Dan Barry, Kassie Bracken and Nicole Bengiveno of The New York Times for 'The "Boys" in the Bunkhouse,' which describes in text, photos and video the lives of men who for 30 years worked in an Iowa turkey processing plant for almost no pay. The story raised questions about the federal law that permitted the men to be underpaid for doing the same work as their non-disabled colleagues, explained how regulators effectively sanctioned the exploitation, and detailed the squalid living conditions and mistreatment the men endured. "The New York Times team spent most of 2013 documenting the men's experience, which was first revealed in stories in The Des Moines Register in 2009. . . ."
The university also said, "The second-place award went to the Anchorage Daily News. Judges also awarded an honorable mention to the Kansas City Star, as well as to a student-created deaf and hearing newscast at Arizona State University. "The contest, the only one devoted exclusively to disability reporting, is administered by the National Center on Disability and Journalism at the Walter Cronkite School of Journalism and Mass Communication at Arizona State University. . . ."
"Some people don't like to equate the issue of gay marriage with the civil rights struggle," Allen Johnson, a black journalist who is editorial page editor of the News & Record in Greensboro, N.C., wrote Sunday. "But what is it, if not a struggle for civil rights? That's why I suspect more African American clergy have not only turned away from their traditional disdain for gay marriage, but embraced it as a cause. "Some state lawmakers also have embraced it as a cause, in fierce opposition to a recent federal judge's decision declaring gay marriage legal in North Carolina. They may be as motivated by politics as personal convictions. But, whatever the reason, they won't go down without a fight. And, in the end, they will lose. "On a personal note, I was born black and raised Southern Baptist. That meant I was taught that homosexuality was wrong because the Bible said so. I also have seen scripture — specifically, 'the curse of Ham' — similarly quoted to defend slavery, discrimination, segregation … and worse. "I am older and wiser today, and so, apparently, are more of the rest of us. Our courts are telling us that laws banning gay marriage are unconstitutional. We should listen. . . ."
"Now I've had enough — I'm quitting the mainstream media," Rebecca Carroll wrote Monday for the New Republic, which ironically has had very few blacks in its newsroom. Carroll, who has been managing editor of HuffPost BlackVoices and xoJane.com and worked at other outlets, also wrote, "I am not necessarily leaving the industry forever, or even entirely. I will continue to write and be vocal about race and culture in America on various platforms. But I'm leaving the staff bullpen of journalism. I'm tired of jockeying for position in a profession that never hesitates to finger 'racists' in public, but can't see the very real racism in its own newsrooms." "This year in light of all the racially charged incidents of police brutality and race being at the forefront of everyone's conversations, we're dedicating our December issue to the topic of race in America — where are we, where are we going and how do we get there,' Mitzi Miller, editor-in-chief of Ebony magazine, told Francine Knowles of the Chicago Sun-Times on Saturday. "After the incident in Ferguson [Missouri], it was important for Ebony to make a statement. . . ."
Jeff Leen, the Washington Post's assistant managing editor for investigations, challenged "Kill the Messenger," the new film about the late reporter Gary Webb, whose 1996 series "Dark Alliance" in the San Jose Mercury news linked the CIA to the spread of cocaine in inner cities. "The Hollywood version of his story — a truth-teller persecuted by the cowardly and craven mainstream media — is pure fiction," Leen wrote for the Post's Sunday Outlook section. The Post was among the newspapers that attempted to discredit the series at the time. Others, such as author Ryan Grim, say events proved Webb right. WPFW-FM, the listener-supported Pacifica radio station in Washington, altered its popular oldies, blues and Caribbean Saturday programming to include discussions of police brutality around the world in light of events in Ferguson, Mo. Academics Jared Ball and Todd Steven Burroughs, with a black psychologist calling himself "Dr. Hate," aired extensive conversations with academics and others in the midst of the programs. "I think it's time for 'PFW to be bold once again," Katea Stitt, interim program director, told Journal-isms by telephone on Monday. When "old-school rhythm 'n' blues" host Andrea Bray told Stitt, "I have brothers and nephews and they are scared" because of police, and pledged her cooperation with the experiment, Stitt said she knew the idea would strike a chord. The programming took place during a fund drive, but Stitt said, "I haven't seen the numbers." Reviewing her stint as New York Times public editor, which began in September 2012, Margaret Sullivan included "Diversity on the Times Staff" among her "overarching topics." She quoted Executive Editor Dean Baquet: "We're not going to stop hiring — I don't believe in hiring freezes." "In addition, he said, he intends to make diversity a priority when making internal promotions. Staff diversity — of all kinds, not just racial — makes a real difference because it inevitably brings a wider range of points of view and experience. That can only benefit the journalism." "The Virginian-Pilot's newsroom will be cut by nearly one-quarter by the end of the year ," Philip Walzer wrote Saturday for the Norfolk, Va., newspaper. Editor Denis Finley said that everyone affected was informed by Friday, and Finley told Journal-isms Monday that none was a journalist of color. In fact, Finley said by email, the proportion of women and journalists of color had likely increased. In Washington, "Thursday, October 23rd, is 'Marion Barry Day' at Radio One's DC radio cluster," dcrtv.com reported Monday. "Marking 40 years of public service in Washington for the current Ward 8 councilman and former mayor. Barry will be live in-studio on all five Radio One DC-based stations. From 9 AM to 4:30 PM listeners can call in and ask questions. He'll be on WYCB 1340 AM at 8 AM, WPRS 104.1 FM at 10 AM, WMMJ 102.3 FM at 11 AM, WKYS 93.9 FM at noon, and at 4 PM on WOL 1450 AM. Several surprise guests will join him on air throughout the day. . . ."
"On Friday, Red Zebra Broadcasting, owned by Washington Redskins owner Daniel Snyder filed its response to the objections to the renewal of WWXX 94.3 FM's broadcast license," RadioInk reported Sunday. "It's a 39-page response (that you can read HERE [PDF]). The filing says, the objections are a frivolous attempt to goad the Commission into banning the team name of Washington, D.C.'s NFL franchise from the nation's airwaves. . . ." Separately, "George Washington University Law Professor John Banzhaf, who filed an objection to the license renewal of WWXX in Washington DC told RadioInk the Red Zebra response to his objection is insulting to current and former FCC Commissioners. . . . "
Criticizing a Time magazine cover story on Asian Americans, Julianne Hing wrote Monday for Colorlines.com, "People who shape the dominant political narrative in this country — politicians, pundits, media — have little use for substantive conversation about any group of non-white people unless it's to uphold, in stark terms, notions of black inferiority and white supremacy. To that end, Asians have actually been the subject of quite a lot of public fascination, mainly as props used to denigrate blacks and Latinos and programs designed to support them and other people of color — including segments of the Asian-American population. All too often, Asians are willing to play along. . . ."
"We really don’t know how many journalists of color hold science beats inside U.S. newsrooms as there is no empirical data," Tracie Powell wrote Sunday for alldigitocracy.org. "Perhaps that is a question the National Association of Science Writers' new diversity committee can help answer. What we do know, based on the attendance at this year’s conference in Columbus, is that more journalists of color should join the association, not only to access some of the many jobs available in this field, but because we need more people of color writing about how science impacts nearly every facet of public life, especially in communities of color. . . ."
"Fox News Latino delivered its best month in nearly two years for (Since December 2012), drawing 1.5 Million Uniques and averaging 6 million combined minutes on the site in September," Brian Flood reported Friday for TVNewser. "The Columbia Journalism Review is seeking several digital correspondents to write smart, analytic pieces on various beats. The freelance work requires that the correspondents maintain an expertise on coverage and developments within their specific coverage area, that they pitch and write two stories…" the editors wrote on Friday. "Bheki Makhubu, the Swaziland editor jailed for two years for publishing articles critical of judges has won the Press Freedom Award at the CNN / Multichoice journalism awards, Swazi Media Commentary reported on Monday.